Went to this newly build T3 with special friend to discover the complete project for the whole Changi Airport. Not just an airport, the design also look into the Go Green and best facilities to enhance the leading air hub in the region. An aptimum amount of diffused sunlight streams down through total 919 skylights fitted with an intelligent computer-controlled system of butterfly-shaped reflectors. Interior designing in the departure hall. Water features with Koi pond together with real trees surrounding. Spectacular five-storey high and 300m wide vertical garden features 25 species of climbing plants which can view from both the Departure and Arrival Halls. Multi-language Welcome messages of 300m wide hand-sculpted backdrop carved. And of course, a lot of retail shops and F&B outlets is waiting to open for business. Guess next time T3 can be one of my choices for shopping or meal. After all, one trip bus can reach there within half an hour time, better than going to Vivo City which I need to take more than an hour to reach. Using this photo as an experimental by using mobile blog, it works but wonder how much does it charge per mailing? 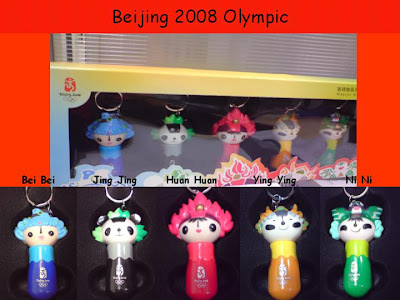 Asked my colleague to purchase any little display from Beijing for the Olympic 2008 when she went there for holiday recently. And I got this little Mascot Ball Pen Set at S$20. Each doll have their own name, called "Bei Jing Huan Ying Ni". Looking at this recycle bin at Khabit MRT station, I wonder are we ready for the green? I remember watching one TV documentary of how Taiwanese handle their rubbish by separately them into plastic, paper, drink cans and rubbish. To head this direction for us, there's a long way for us to go. I also wonder how often the rubbish was collected from them, daily or weekly? 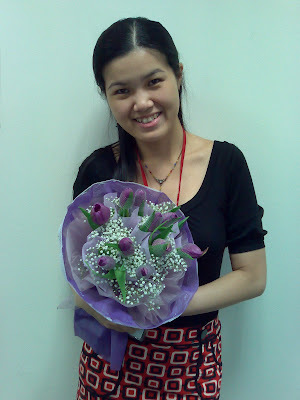 Last working day in Singapore, Ivy is giving the whole dept a farewell lunch. I think this cater company really put in effort to gain more business, with this whole set (included Nasi Brani, dessert, fruit, mango pudding and teh tareh) it cost S$4.90. Worth it! My colleague - Ivy is going to Brasil for her 2 years secondment soon so we had the farewell dinner for her. 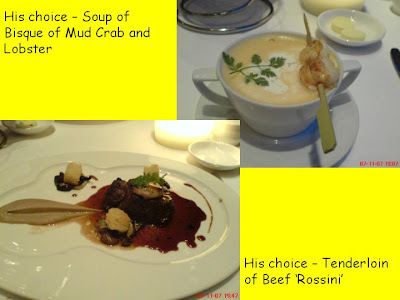 We went to Tung Luk Restaurant at Vivo City and enjoyed a wonderful night with the wonderful food. 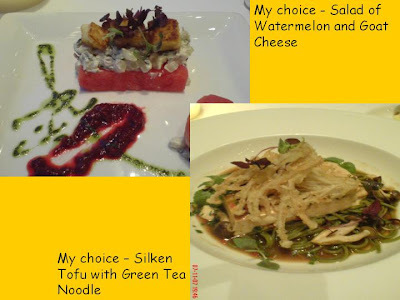 Even my vegatarian food was great too! Our desserts Part 2 The food is indeed great, and the price too. But once a while when we can still afford it, I think we should pamper ourselves. Mine? I thought I am in the winter season. I am not kidding. Not everyone in the office feel the same coldness like I do. Maybe cos I am sitting near the corner. The coldness is making me so headache sometime. Sigh. 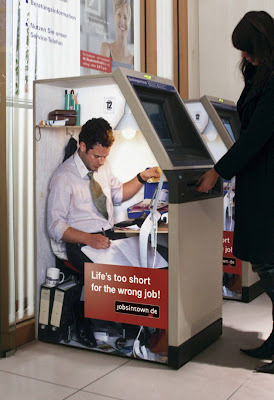 Received these few advertisements from my friend's email, found it very creative and hey, it's really ring a bell. 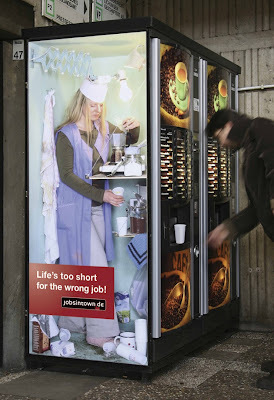 Is your current job a right one for you??? What is your job centrality??? For me, satisfaction, teamwork (I always believe no one can handle and complete the job individually) and very importantly, work-life balance. And I always hope to learn more from my seniors to handle things in professional way cos this is what I am poor at. Well, I can only pick a little 'professionalise' from this and that person at this moment. But everyone have their own individual strong point that we can always learn from. Hope one day I can find one professional person that I am admire to learn from. After receiving the surprise flower, we had our dinner at Equinox Restaurant located at Swissotel The Stamford Hotel at Level 70. With the astomphere and the dishes, the night become more romantic and sweet to me. Views from the high top of Singapore. Can see many constructions going on around the area, the city is getting more and more exciting! 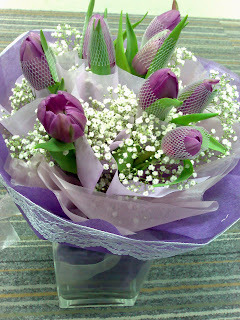 I received surprising flower from special friend to celebrate our special day today! Hope tonight our dinner will be romantic and sweet too. My group of colleagues and I went dinner at Made In China Restaurant at Hua Song museum, which consider a new place to me. First, I didnt know that Haw Par Villa is still open to public. Second, I didnt know that there is a fine dining Chinese Restaurant at this Hua Song Museum which we enjoyed the food a lot. It's been at least a decade away since I went to Haw Par Villa. I remembered its used to be so crowded when it first opened after the renovation as a enternainment park. But due to several reasons, this became a failure project and now it's total opposite when we went there in the evening. So for those who might want to catch back some of your childhood memories, Haw Par Villa might be the right place for you. Hmmm.....too bad I didnt bring my camera with me to take some good photos.